As the mountains turn to fire with the colors of fall let’s celebrate the changing of the seasons with the Fall Fire Festival On October 10th, 12pm – 4pm and Harvest Craft Fair from 10am – 4pm! Find us along Long Lake’s Main Street. Long Lake Town Hall is 1204 Main Street and the Long Lake Central School lawn is right across the street. Parking available at the Long Lake Town Hall and Long Lake Central School. The Harvest Craft Fair boasts a number of gifted and creative artisans bringing you American Made products. Look for Santa’s Attic & Mrs Claus’ Kitchen – herbal & spice blends, soup-bread mixes, assorted cheeses, Rustic Creations – Rustic Furniture, Chipman Woodworks/Gary Pierce – wooden bowls, rolling pins, and cheese boards, Moose River Candle Company selling soy candles, handmade soaps, hiking sticks and keychains, Bob & Linda Jones selling wooden fish & duck decoys, swans, herons, geese & loons, Piece by Piece selling stained glass, suncatchers, night lights, panels 3-D stars, plant stakes, Fauna on Flora selling Etched Tree Fungus, Wesley Jennings selling jewelry made from stones they collected and Creative Creations selling floral arrangements, note card sets, miscelleouns paper crafts, Halloween Crafts, suncathers and wine-glass charms. The Fall Fire Festival is a free carnival like festival that will begin at noon on the Long Lake Central School Lawn. It’s location is right across from the Long Lake Town Hall (the fire house) so visiting both the craft fair and the Festival is a snap. Kids will have the chance to earn tickets for prizes by playing games such as pumpkin bowling, pumpkin pop, milk bottle baseball, ladder toss and many more. Activities for adults and kids alike will include games such as ladder ball, corn hole, and horseshoes. In additions to the games there will be an obstacle course that kids can race through, a bounce house to jump in, and photo booth to capture the day’s memories! Food and kettle corn will also be available for purchase! Other activities will include the popular pumpkin seed spitting contest for all ages as well as scarecrow contest. Participants can either build their scarecrow ahead of time or at the festival with materials supplied. Prizes will be awarded for the ‘Most Frightening,’ ‘Most Traditional,’ and ‘Most Humorous’ scarecrows! Back by popular demand, entertainers CirqOvation! With interactive stilt walking, a living statue, and fire manipulation this dynamic duo are sure to entertain the crowds throughout the day! While the kids are playing, start your Christmas shopping early! Across the street at the Town Hall local vendors will be selling their handmade American Wares starting at 10am. Enjoy a selection of gifts and crafts. Admission is free. Fall can be an unpredictable time of year, sometimes cold, sometimes warm. We’re prepared for both! On a cool October day warm up by the large fire pit or grab some warm drinks and food from our food and beverage vendors. If it’s rainy we will have as many of the activities as possible under a large tent. Joan Collins from Adirondack Avian Expeditions, a local birding and guiding expert, travels frequently, early in the morning and spots incredible wildlife. On September 21, 2015 Joan photographed this Bull Moose along Route 28N in Long Lake (about 3/4 miles past the rest area) heading towards Newcomb at 8 a.m.
Joan stopped for a sad reason, having spotted a dead baby Black Bear in the middle of the road. Joan was in the car trying to find something that to pull the bear out of the road when she glanced in the rearview mirror and saw the huge animal entering the highway behind the vehicle. Joan grabbed her camera and stayed by the car with the door open, ready for a quick getaway in case the moose decided to get aggresive. Based on Joan’s account she was amazed at the length of time the bull took to stare at her. As the bull moose walked a few steps toward her when a car came along and frightened it off the road. Two men who work for the highway department showed up a few seconds later and told her it was the third (road-killed) baby bear they have retrieved in the past month. It was extremely foggy this morning, which likely explained this death. Wildlife moves about in the fall as they prepare and gear up for the winter season. Driver’s should be alert on the roadways, as one never knows what to expect. Moose, squirrels, deer, bears and turkey’s pose dangerous road hazards particularly in the fall. As a licensed guide Joan Collins leads hiking trips and excursions for the Town of Long Lake. Joan operates her own wildlife birding and guiding service. Joan Collins is a New York State licensed bird guide, bird walk leader, writer, and speaker on ornithology topics. She has led walks and made presentations for many organizations including Audubon, the Adirondack Mountain Club, and the New York State Ornithological Association. Joan also belongs to the ranks of the intrepid Adirondack 46ers (having climbed all 46 peaks in the Adirondacks over 4,000 feet). Visit her website for more information. Hoss’s Country Corner announces OctoBEARfest at Hoss’s Campground at 1142 Main Street, Long Lake, NY on October 3rd from 10am-4pm. This benefit festival will be raising funds for Randy’s Patient Assistance Fund through the C.R. Wood Cancer Center at Glens Falls Hospital. This fund helps cancer patients with their out-of-pocket expenses including gas cards, co-pays, lodging assistance, pre-paid cell phone minutes and prescription co-payments. Randy’s Patient Assistance Fund was set-up in memory of Randall Favreau who was diagnosed with lung cancer in 2011. A roster of talented musicians have stepped forward to donate their performance time from 10am until 4pm. Performances include a solo performance by Paul Roalsvig, known in the music world as Yod Crewsy. Originally from Buffalo, formerly of the Splat Cats, Jacklords and Dark Marbles, Yod will kick off the event with a mix of songs with something for everyone. The featured performance will kick off at 2:30pm by The Pete Vroman Band. Eric Granger and Placid Productions will be donating time and equipment to provide sound for the event. Pete Vroman hails from Scotia and Newcomb, NY. Pete has an extensive musical resume including schooling at the Berklee College of Music in Boston, a member of the progressive rock band, Dream Theater and most recently a founding member of The Art of War. Vroman looks forward to showcasing original material from his latest release of his CD of original music “Spring.” In addition to his originals the crowd will enjoy selections featuring songs from Tom Petty, Steve Miller, Little River Band, Ozzy Osbourne, Led Zeppelin, Rolling Stones and country music. Pete classifies his set as having an upbeat, feel good, vibey eclectic mix of fan favorites from the 70’s. A beer and wine tent will be on site. Beverages have been donated by the vendors to be sold with the proceeds donated to Randy’s Patient Assistance Fund. Special Thanks to Big Tupper Brewing, Saratoga Eagle and Otter Creek Wintery. Vendors will be on site selling wares including jewelry, handcrafted wooden bowls, knives, and more. Silent auction items include antiques, original art work from local artisans, an incredibly cozy, warm blanket just in time for the cold winter months and more to be added including a cord of wood. Antiques and book dealer Ted Comstock from Saranac Lake, will be exhibiting a selection of out-of-print Adirondack books, vintage photographs and a number of sporting items. Be sure to stop by and visit Ted. His collection of Adirondack artifacts are only part of the story as Ted himself has a wealth of knowledge about the history of the region and is well worth the stop. This festival atmosphere will offer plenty for the kids including face-painting, henna tattoos and a visit from the Long Lake Fire Department. Slated to be on site include a wine and beer tasting tent as well as local food vendors to showcase some of favorite local foodie selections including Chicken in a Cup, hard ice cream, Hot Dogs, Chili and more. The Long Lake Fire Department will be on the site with one of their fire trucks so kids should be ready to get wet. Old Tyme ADK Photo booth will be set up and Sara Wojtowecz from the Northstar Sculptures and the touring Chainsaw Chix will be on hand carving her incredible wooden sculpture animals live! This event will go on rain or shine, so don’t worry if it’s raining, there’s always a tent! Food and drinks will be sold. A portion of the proceeds will be donated to Randy’s Patient Assistance Fund. There is no admission to the event. Donations will be accepted at the gate. $20 will provide guests with a T-shirt and $5 ticket for the door prize. Interested vendors are invited to participate for a fee of $25. All vending fees will be donated to Randy’s Patient Assistance Fund. Thomas Cole, founder of the Hudson River School of American landscape painting, visited Long Lake, NY in 1846. Cole was accompanied by his student, Benjamen McConkey from Ohio, Louis Legrand Noble, his pastor and eventual biographer from St. Luke’s Church in Catskill, N,Y, and the noted Adirondack guide, John Cheney. He produced many sketches of the area on this trip and completed at least two paintings of Long Lake in his studio after wards, though these paintings have been “lost” to the world of art history—in fact, Hudson River School scholars have doubted or ignored their existence, denying the locality of Long Lake a place on Cole’s artistic map and completely obscuring our place in the annals of our first great National school of art. This September on Monday, the 28th, Matt DeLaMater, Research Fellow at the New York State Museum and doctoral student at SUNY Albany , will revisit Cole’s trip to Long Lake with slides of his drawings and paintings. DeLaMater, a summer resident, is trying to locate the paintings Cole produced of Long Lake, and restore formal recognition to the importance of Cole’s Adirondack visits. Research on Cole has taken DeLaMater to Detroit Institute of Arts, the Albany Institute of History and Art, Cedar Grove, and Cole’s home in Catskill. NY. He hopes you will be able to assist him in identifying Long Lake locations from whence Cole sketched beaches, boats, rocks and trees, etc. as well as in helping to confirm the paintings in question. The Long Lake Historical Society together with the CVW Long Lake Public Library are the sponsors of this event which will be held at 7:00 pm at the Long Lake Library. Admission is free, all are welcome. The Long Lake Long Boat Regatta will kick off Saturday, September 26th, 11am at the Long Lake Town Beach. This is a competitive event featuring cash prizes for Pro-Voyageuer Canoes, Pro C-4 Stock, Pro Adirondack Touring Kayaks. There are non-cash prizes for Guideboats and other NYMCRA/AWA classes. Registration opens on the porch of the Adirondack Hotel at 9am – 10:30am. The Course: Boats paddle to the south end of the lake and back up towards Round Island. Paddlers from all over the north east converge on this fun, yet competitive event for a $5000 purse. This is a great place to get your last big paddle in before the cold air totally dominates the waters. 1st place – $1000, 2nd place – $ $800, 3rd place – $600, 4th place -$400, 5th place – $200. 1st place – $600, 2nd place – $400, 3rd place – $200, 4th place – $120. • Pro entry is $35 per paddler, Amateur racers pay $30 (AWA members save $5). Minimum of 3 boats per pro class for pay out. • AWA Standard Voyageur Canoe rules apply – at least two males and 2 females in the boat –. Minimum of 6 paddlers in the boat. 10 miles. • C-4 Teams must have at least 1 man and 1 woman in the boat. NYMCRA stock rules.10 miles. • NYMCRA Touring kayak rules apply. • The Northeast College C-4 Championship teams will be 2 females and 2 males in Stock C-4’s. and sign up for the New York State 200 and 400 mile club. The Long Lake Long Boat Regatta is hosted by the Adirondack Watershed Alliance and the Town of Long Lake Parks, Recreation and Tourism Department with support from the North Country Regional Economic Development Council. Adirondack Watershed Race Circuit Series awards will be presented at the post race barbecue. Join us on Friday night at the Adirondack Hotel for an end of the paddling season celebration! Sunsets vs. Celebrities in Long Lake, Who Wins? Sunsets and celebrities in Long Lake make for the biggests posts ever on Long Lake, NY’s facebook page. 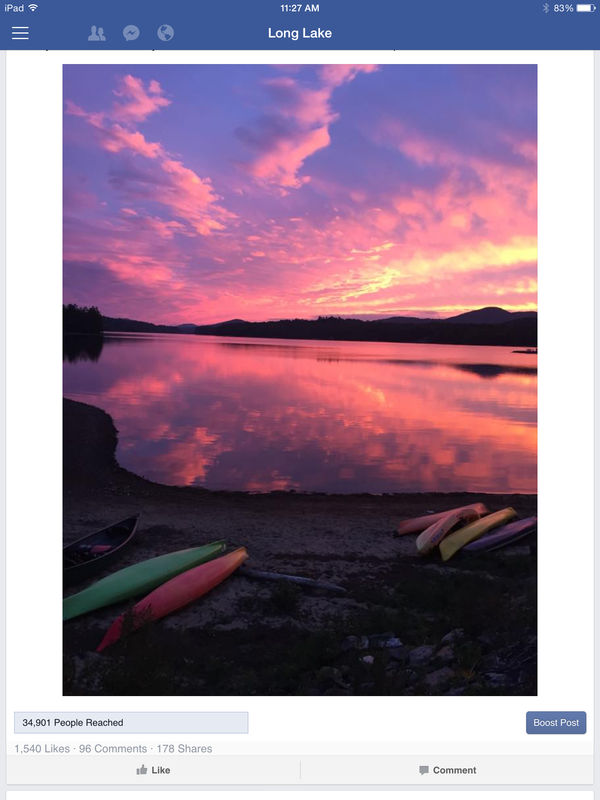 A passer-thru Long Lake stopped to snap an image of the sky last week and kindly shared it by sending it to the town website email. From a Long Lake fan. “I drove though Long Lake last evening & pulled over by the bridge to watch the sunset. Glad I did, you have a wonderfully beautiful town in the Adirondacks. Attached is a picture I took that I find stunning, best picture I ever took. Wasn’t sure who to send picture to, but wanted to share it.” Anthony Stefanelli. Look at it here. Last week the Guggenheim Motorcyle Club were touring around the northeast, having stopped in North Adams, Massachusetts to visit a movie theater and continue on with an honorary ride for former member, Dennis Hopper. Mohawk Theater Pitstop. 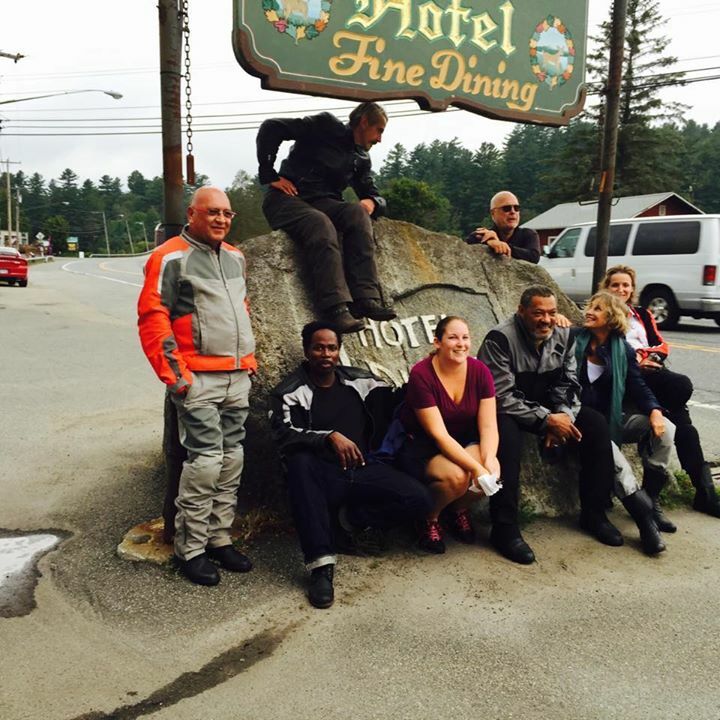 A photo featuring Jeremy Irons and fellow members of the Guggenheim Motorcycle Club, including Laurence Fishburne, Thomas Krens, Lauren Hutton, Harold Perrineau and Catherine Nouvel was snapped after lunch and posted on the Long Lake Facebook page. For Long Lake, a town in the central Adirondacks, being discovered by celebrities, seemed to be a big deal, at least on Facebook. I do know that when I showed my very unimpressed son a close up image of Laurence Fishburne he responded dryly, “Oh that’s Morpheus.” Then I dramatically stretched out my fingers to blow up the image so he could see that Morpheus was actually in Long Lake standing in front of the rock of the Adirondack Hotel. Finally in my sons eyes, I had done something right. I knew someone who met Morpheous.. right here in town in the middle of the Adirondacks of upstate New York. My son seemed to look at me differently and not with his usual teen disdain, he looked at me, like “wow, maybe living here isn’t so boring after all.” For me, that was the biggest win of the week! But even with the celebrity visitation, the most important revelation to discover when anaylysing the Facebook Stats and insights, and countries of origin, and geotags, and whatever else it is that doesn’t throttle a facebook post, what is most extraordinaire in the day of Snapchat and Periscope and Twitter and Pinterest and Instagram, what makes our location so incredibly special is that it wasn’t the celebrities that impressed the most. No indeed, it was simply the incredible sunset. A happenstance of wonderful timing. A moment that comes anytime of year, when you are lucky enough to see the changing color of the sky and the clouds. It was a gift given by Anthony who kindly took the time to share his incredible moment with us, on our website. So I thank you Anthony. Thanks for having such great timing and taking such an amazing shot and most importantely, thank you for sharing. And then there is always the stats and evidence, the facts. Celebrity photo — 739 Likes… Sunset Photo — 1537 Likes. So with that said.. Mother Nature is still the biggest star in the Long Lake. We’ll keep our small town small. That works out just fine. Long Lake Native and artist Matt Burnett returns to Long Lake for another installation of Portraits in the Wilderness to complement his current exhibit featuring portraits of Long Laker’s, Bob Dechene, Frances Boone Seaman and Matt’s father, Willy Burnett. The outdoor portraits are currently located on Burns Road Wall on NYS Route 30, Tupper Road. The portraits will be on display through the fall leaf peeping season. Artist Matt Burnett prepares to set the portraits. On Friday, September 11th, Matt installed two additional large-scale portraits featuring local Long Lakers, Valerie Galvagni and Jim Swedberg. Matt chose Jim Swedberg because of his connection to Long Lake, the Adirondacks and the Hudson River. Jim has rafted the river for years and recognizable as the person steadfastly holding in place with his camera. When folks raft the Hudson, they will cross paths with Jim, he may be the one person who has rafted the river more than anyone else. The second portrait showcases local nurturer, childcare giver and mother to all, Val Galvagni. Val raised her own family in Long Lake and then took on a new generation of millenials growing up in Long Lake at a time when there was very little childcare available to working parents. Val stepped in and took on the challenge because she loves children and welcomed the opportunity. When asked how she felt to be painted and celebrated Val said. “It made me very giddy, I’m so flattered” As a childcare giver Val is part of the fabric of the community. Val says she does love children and having them connect to her is just part of who she is. Val was stumped when Matt asked her to be a part of the portrait collection so she suggested including children in the portrait. Val has always surrounded herself with kids, all ages. Kids flock to Val. Matt’s portraits are currently on display on the Tupper Road, NYS Route 30 along the Burns Road Wall just north of the Long Lake Bridge. There is also a large-scale portrait of Buttermilk Falls still on display on Deerland Road, a short distance from the sharp curve near the start of North Point Road.